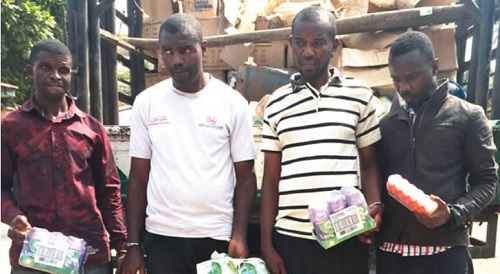 The gallant operatives of the Lagos State Police Command have arrested four men who allegedly produce fake Dettol disinfectant and air freshener. Some suspects identified as Francis Ume, 32; Chidubem Achezie, 44; Peter Ume, 44; and Ejike Jacob, 41, have been arrested by officials of the Nigerian Police Force from the Lagos State Command for allegedly producing adulterated Dettol disinfectant and Air Wick air freshener in the Okokomaiko area of the state. According to a report by PUNCH, the state Commissioner of Police, Edgal Imohimi, told journalists on Wednesday that the Divisional Police Officer in charge of the Okokomaiko Police Station, CSP Aliyu Lukman, acting on a tip-off, mobilised his operatives to the suspects’ operational base and arrested them. He added that the operatives also impounded a truck loaded with cartons of the adulterated disinfectant and air freshener valued at N7m. The CP added that investigation was ongoing and that the suspects were still being interrogated with a view to discovering their other outlets and accomplices so that they could be shut down andthe other suspects would be arrested.